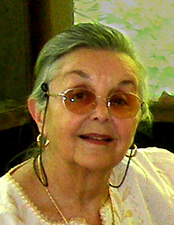 Marjorie Tomchuk , Canadian by birth, has resided in the United States since 1953. She attended the University of Michigan, earning both a BA and MA. She taught art in Tokyo, and studied at Sophia University, learning woodblock printing from Toshi Yoshida. She also lived in Frankfurt, Germany for two years, where she created etchings in the studio of Helga Kaiser. In 1965, Tomchuk moved to New York City, working at Pratt Graphics Center, before setting up a fully equipped studio in SOHO. Since 1970, she has lived and worked in New Canaan, CT. Her art was carried by Lublin Graphics, 1968-1976. From 1976 to the present, Tomchuk has been an independent artist producing self published editions of graphic work. The artist explored embossings and in 1980 progressed to the use of handmade paper. She had a papermaking facility installed in her studio and began producing unique embossings on artist-made paper. Many of her paper art works are commissioned for private and corporate use. The artist has traveled worldwide, gathering impressions and inspiration for her images. She has extensively photographed and documented her trips. The artist's work has been exhibited throughout the United States and in Canada, Mexico, Chile, Europe, Australia Japan and Korea.